While technology continues to improve the omnichannel experience for customers, more than half of Canadians still prefer to get answers quickly over the phone. But there’s a serious problem – when the phone rings, they’re barely picking up. A study from Boston Consulting Group says 88 per cent of business calls are going unanswered, and while this statistic is U.S.-based, the problem exists in Canada as well, where the Canadian Radio-Television and Telecommunications Commission (CRTC) has asked telephone service providers to help Canadians fight back against nuisance calls by blocking them on their networks and providing call-management services to their subscribers. It’s an aggressive approach, says Jonjie Sena, senior director of product marketing for technology company Neustar, pointing to the March 31, 2019 deadline. “Regulations aren’t often welcomed when they are forced down,” Sena told ITWC after his keynote presentation at the Canadian Telecom Summit in Toronto. But regulation is needed, he adds, pointing to Canada’s inadequate traceback capabilities and the numerous phone scams that have circulated the country in recent years. 88 per cent of consumers are more likely to answer a phone call if they can be certain of who is calling. According to the the National Do Not Call List (DNCL) 45 per cent of the complaints received in 2015 involved an element of illegitimate caller ID spoofing. An emerging phone fraud scheme has already cost at least five victims in Toronto more than $5 million, according to Toronto Police, and they suspect the scheme has spread across the country. Fraud campaigns during tax season are nothing new, but according to the VP and country manager for Symantec Canada Ajay Sood, it’s at an “all-time peak” in Canada, and fraudsters are tricking people into using bitcoins to pay their taxes. And the Better Business Bureau of Canada says Canadians lost more than $100 million to various scams, most of which involved phone calls. What a future call might look like that has STIR and SHAKEN working in the background, verifying calls. Slide from Neustar presentation. Once the technology is widely adopted, Sena says businesses could monetize phone calls. Slide from Neustar presentation. After several consultations with and submissions from individuals and telecommunications service providers (TSPs) , the CRTC decided to force TSPs to install authentication and verification of caller ID information for voice over internet protocol (VoIP) calls no later than March 31, 2019. VoIP calls have been specifically targeted because of how easy it is for fraudsters to place international calls for almost no cost. They can also alter the caller ID, making it appear as a local call, even if it’s coming from the other side of the world. During his presentation, Sena explained what the Federal Communications Commission (FCC) in the U.S. has done to try and tackle the problem. 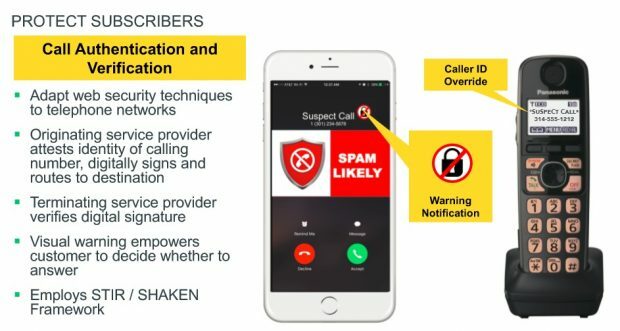 It determined a new industry standard for call authentication was required and turned to secure telephone identity revisited (STIR) and signature-based handling of asserted information using toKENs (SHAKEN), essentially two services that create digital certificates that ensure the calling number of a phone call is secure. In November 2016, the CRTC signed an agreement with their U.S. counterparts at the FCC to combat illegitimate robocalls and caller ID spoofing together through research and education. The Alliance for Telecommunications Industry Solutions is testing STIR and SHAKEN capabilities with 27 participants, including Canadian company Telus. In addition to implementing VoIP authentication and verification protocols by March 31, 2019, the CRTC has also asked TSPs to establish industry administrator to issue the certificates required to authenticate and verify IP-based voice calls, and to develop a call traceback process for the CRTC to review and approve. Sena says he doesn’t think STIR and SHAKEN are the silver bullet businesses and carriers are looking for, but it’s a step in the right direction.